NEWS FLASH!!! !....We have a few Pin kids looking for good homes! Check out the Available pages, or please contact us!!! !.................News Flash!!! !...........Le Pins Roadside Assistance is towing away the competition in the mid-west, 4 weekends out and she is knocking down the door to her Championship!!!! ...........Le Pins Slipery When Wet is not far behind her sister, stay tuned as these girls demand to be noticed!! !..........Sorita's Verbal Warning isn't doing too bad himself, he is now singled out just looking for majors to finish his Championship!!! Way to go!!!!! You lit the world on fire and burned a hole in the heart of all those you met. 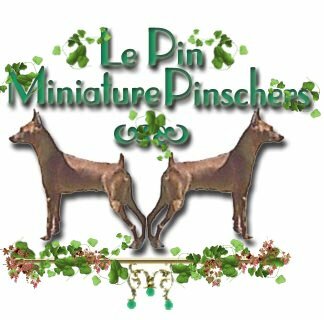 We at Le Pin are dedicated to the Miniature Pinscher breed. 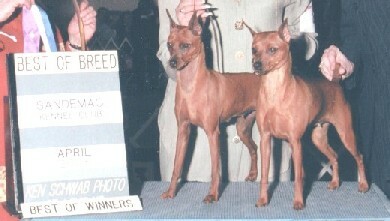 Miniature Pinscher Club of America. as well as the Steel City Kennel Club. We breed for ourselves and never for profit. they live in our home and share their lives with us. Our minpins are our companions first and our show dogs second. Nothing can replace the love they share with us. We do not believe in a Kennel situation. You never know when a minpin will get under your feet!!! Please take a moment and sign the guest book. We would like to hear from all the visitors.